Sara Şahinkanat (1966, Istanbul) graduated from Üsküdar American Academy and Boğaziçi University’s Translation and Interpretation Department. She worked as a translator and in the advertising sector for many years. Her son Tan was born in 2001. The illustrated books that she began to write to please him, she now writes for other children as well. She received an Acceptance Award 2009 in the Oshima International Handmade Picture Story Book Contest with her book, The Lizard’s Magical Tail. 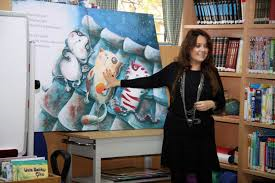 Her book entitled Who’s Afraid of Little Red Riding Hood, illustrated by Ayşe İnan Alican, was chosen as the Best Picture Story Book of the Year 2009 by ÇGYD, also known as IBBY Turkey (The International Board of Books for Young People). Her other boks include It’s Tough to Be A Little Octopus (Illustrated by Feridun Oral), and Monkey King (Illustrated and co-written by Feridun Oral), and Knowledge Hunters On A Secret Mission / The Beyoğlu Adventure.